Boggsville Boatel Turns Defunct Boats into Floating Hotels for NYC! 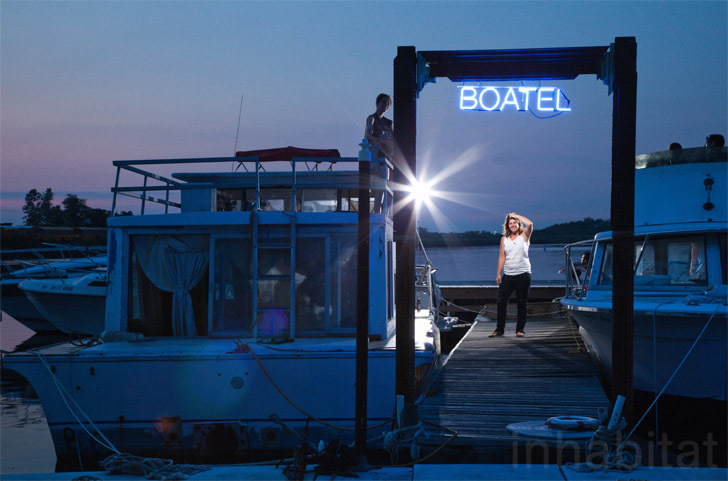 PHOTOS: Boggsville Boatel Turns Defunct Boats into Floating Hotels for NYC! Though many non-New Yorkers (and many a Manhattanite) fail to realize that there is more to New York than one jam-packed island, some of the city’s best kept summer secrets lie on edges of the outer boroughs. No need to hop on the railroad out to Long Island to experience ocean front relaxation, just take a ride down to Far Rockaway on the A train. Just a few blocks from the subway, you’ll find your seaside adventure awaiting at Marina 59. Here, Constance Hockaday has transformed seven defunct boats into mini floating hotels. The community, dubbed the Boggsville Boatel, is part art installation, part waterfront getaway, that lets you experience the simpler life without ever leaving the city. Hit jump for our exclusive photos! Though many non-New Yorkers (and many a Manhattanite) fail to realize that there is more to New York than one jam-packed island, some of the city's best kept summer secrets lie on edges of the outer boroughs. No need to hop on the railroad out to Long Island to experience ocean front relaxation, just take a ride down to Far Rockaway on the A train. Just a few blocks from the subway, you'll find your seaside adventure awaiting at Marina 59. Here, Constance Hockaday has transformed seven defunct boats into mini floating hotels. The community, dubbed the Boggsville Boatel, is part art installation, part waterfront getaway, that lets you experience the simpler life without ever leaving the city. Hit jump for our exclusive photos!